Whisk 1 cup buttermilk, 1 tablespoon salt, 1 teaspoon pepper, dash hot sauce, ¼ teaspoon garlic powder, ¼ teaspoon paprika, and pinch cayenne together in large bowl. Add chicken and turn to coat. Refrigerate, covered, for at least 1 hour or up to 24 hours. Adjust oven rack to middle position and heat oven to 400 degrees. Whisk flour, baking powder, 2 teaspoons pepper, 1 teaspoon salt, remaining ¾ teaspoon garlic powder, remaining ¾ teaspoon paprika, and remaining cayenne together in large bowl. Add remaining ¼ cup buttermilk and mix with finger until combined and small clumps form. Working with 1 piece at a time, dredge chicken pieces in flour mixture, pressing mixture onto pieces to form thick, even coating. Place dredged chicken on large plate, skin side up. Heat oil in 11 inch straight side sauté pan over medium high heat to 375 degrees. Carefully place chicken in pan, skin side down, and cook until golden brown, 3 to 5 minutes longer. Transfer chicken to wire rack set inside rimmed baking sheet. 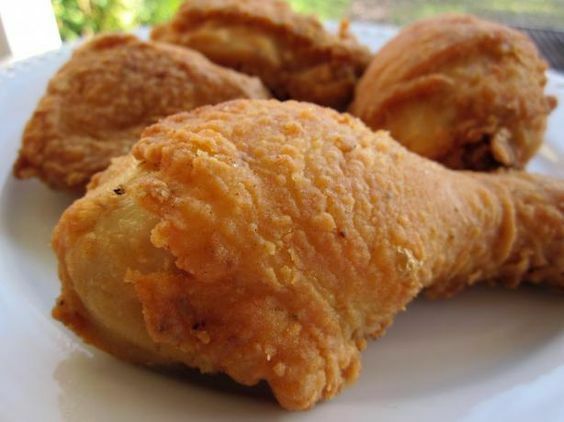 Bake chicken until breasts register 160 degrees and legs/thighs register 175 degrees, 15 to 20 minutes. Let chicken rest for 5 minutes before serving. End.